Explore our interactive maps! Look here for examples of how to use the maps. Definitions are below. Base Layer/Overlay – Industrial Zones: Standardized industrial zones across the 101 cities and 8 unincorporated counties of the San Francisco Bay Area. For more information see Industrial Land Supply and Demand report. 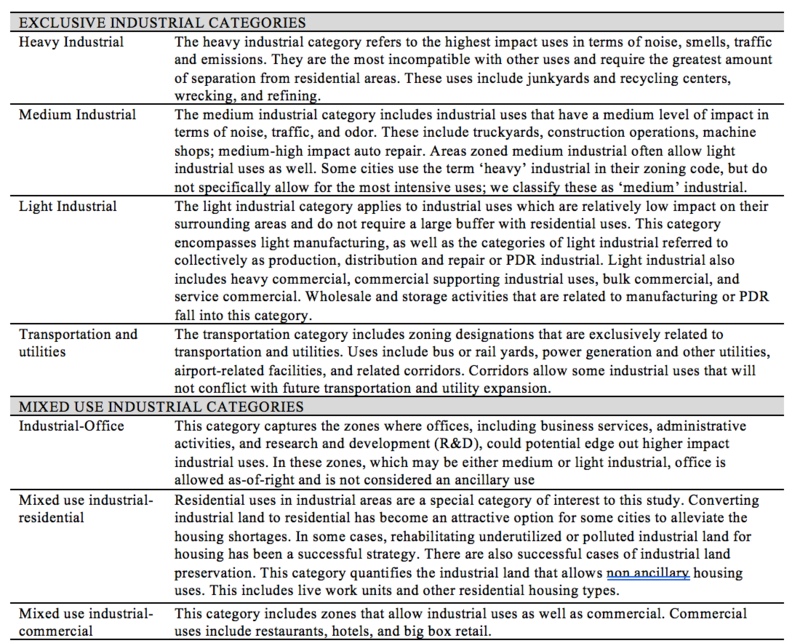 Base Layer – Conflict Regions: Industrially zoned parcels (light, medium, or heavy industrial, or transportation and utilities) that have been redesignated as non-industrial in the local general plan. For more information see The Conversion of Industrially Zoned Land report. Base Layer/Overlay – Priority Development Areas: Places identified by Bay Area communities as areas for investment, new homes and job growth. Base Layer – Potential Displaced Jobs: Number of jobs (2011) located in industrially zoned areas that are also conflict regions or priority development areas, and thus are susceptible to conversion to other uses. Base Layer – Sea Level Rise: Areas likely to be underwater with a six-foot sea level rise (the high-level projection for 2100). Base Layer – Employment 2011: Number of jobs located in block groups in or adjacent to industrially zoned areas in 2011 (Source: National Employment Time Series data). Base Layer – Employment 2040: Number of jobs projected to be located in block groups in or adjacent to industrially zoned areas in 2040 (Source: adapted from Plan Bay Area projections). For more information see Assessing the Impacts of Changes in Industrial Employment on Job Quality and Commuter Patterns report. Base Layer – Worker home location, jobs < $3,333/mo: Residential location in 2013 of low-wage (earning less than $3,333 per month) workers located in block groups in or adjacent to industrially zoned areas (Source: LEHD Origin-Destination Employment Statistics). Base Layer – Worker home location, jobs > $3,333/mo: Residential location in 2013 of middle to high-wage (earning more than $3,333 per month) workers located in block groups in or adjacent to industrially zoned areas (Source: LEHD Origin-Destination Employment Statistics). Base Layer – Worker home location: Residential location in 2013 of all workers located in block groups in or adjacent to industrially zoned areas (Source: LEHD Origin-Destination Employment Statistics).